The whole town comes together for the duration of the weekend&apos;s events, which kicked off Friday night and lasted until Sunday evening. Good, clean fun such as carnival rides, contests, live music, food and a parade highlight the festivities that attract thousands of people from around the area. Things get pretty dirty on Saturday, however, when the annual mud volleyball tournament kicks off just south of the city pool. Ninety one teams across three divisions (women&apos;s, men&apos;s and co-ed) competed in this year&apos;s day-long, double-elimination tournament. Each team was composed of five members, and matches were played to 11 points. With rally scoring, the matches seemed to fly by, but that gave participants plenty of time in between to socialize and throw unsuspecting spectators into pits of muddy slop. Maneuvering through the thick, knee-high mud proved to be challenging for most teams. Several times, I found myself voluntarily falling toward the ball&apos;s path because moving my feet wasn&apos;t an efficient option, leading to laughs from friends nearby. When two teams finished a match, it was hard to tell who had won and who had lost. Everyone left the court laughing and smiling. Interested in playing in next year&apos;s tournament or attending one of the other many events? Information will be posted on the Arma V-J Homecoming Facebook Page as the event nears next August. 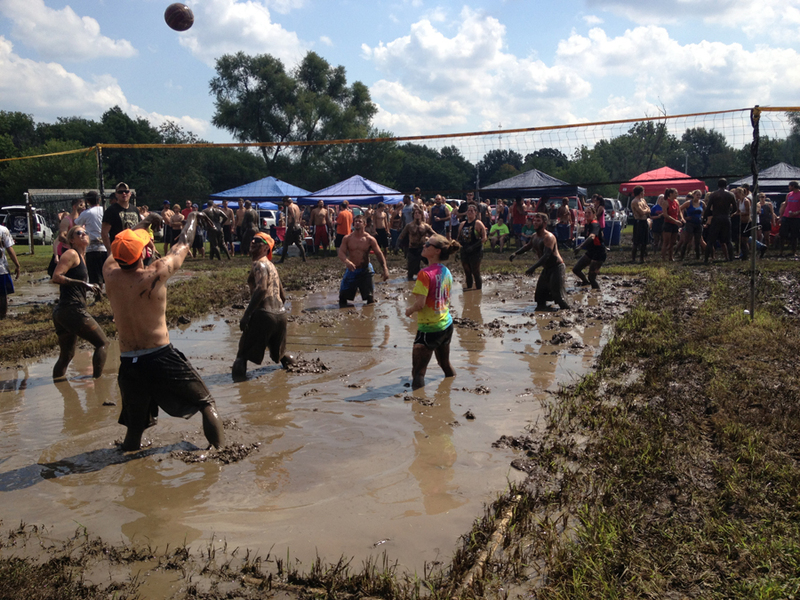 If you can find five friends interested in digging mud out of their ears for days, the mud volleyball tournament is a great daytrip activity. Be sure to bring a few coolers filled with cold beverages to beat the August heat and stay hydrated. I&apos;d recommend using the provided rinsing station after each match to remove any mud; otherwise, you&apos;ll end up with some wicked tan lines. If you&apos;re planning on going as a spectator, just assume you&apos;re going to end up in the mud. Otherwise, you&apos;ll want to hide in the bleachers near the courts and hope your friends don&apos;t see you. It&apos;s advised that everyone brings a clean set of clothes because the mud is a lot of fun. While events around the city provide fun for all ages, the tournament presents the younger crowd (including many students from nearby Pitt State) a fun opportunity to join in the community spirit surrounding a great event to honor our nation&apos;s heroes.